This scheme aims to bring longevity and depth to the streetscape; conceived as an inhabited sculpture with four outer petals opening outwards to form the apartments balconies, with a bright and uplifting interior atmosphere. The residence for the embassy s staff and the ambassador was designed to marry two worlds and lifestyles. The massing respects the proportion and in rhythm of surrounding buildings. Towards the main road Its elegant form blends naturally with the streetscape while featuring iconic Indian white lotus shaped balconies. 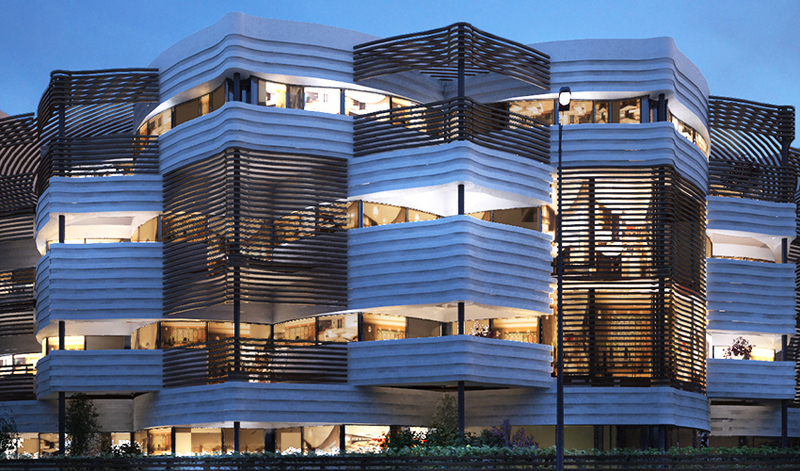 The choice of materials on the other hand will be applied to give the building a Moroccan texture and feel. White washed render, dark timber and steel perforated screens form the main external surface finishes; using materials that can be locally sourced and common of Moroccan architecture. The internal facade employs white screens with an Indian character. The laser-cut steel used for the facade has two purposes; to add an Indian motif and serve as a sunscreen. The perforations allow sufficient light and ventilation to the quintessential louvered outdoor space that we find in all typical Indian dwellings.